A very unusual specimen of light-green Calcite from a small find in Inner Mongolia. 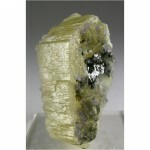 It features a numerous Calcite crystals inter-joined to create a formation of connected “balls”. 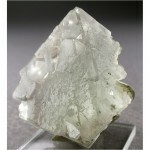 Numerous tiny Herkimer-type Quartz crystals are sprinkled all over the Calcite. The specimen is also a FLOATER, completely crystallized on all surfaces, with no apparent point of attachment. Lots of interesting detailsfor you to explore all over. 3.8 x 3.4 x 2.4 cm.